CULP initiated its interventions in 12 habitations in one block of Jaipur district (Rajasthan) in 2002 and benefitted about 350 out-of-school adolescent girls. With the success of the intervention, the programme out-reach significantly increased & mainstreamed one lakh children and benefitted more than 2.5 lakh children. For addressing the economic vulnerability of poor of the poorest families, it has linked 1500 poor families with social security schemes; oriented 4500 teachers for quality education & Child Protection Committees for child rights; imparted life skills to adolescents. It has incorporated bridge course as an integral part of formal school and enrolment in age-appropriate grade under Right to Education Act. It has developed Learning Material for early grade students & teacher educators & District Institute of Education and Training (DIET) for Child Friendly Schools. Child Rights project aims to create an enabling environment, ensures children’s rights leading to prevention of child labour & migration from tribal area. Scaled up to 6500 habitations in 15 blocks of 3 districts covering about One lakh out-of-school children (75% girls) in a period of one and half decade. About 80% girls successfully joined mainstream schools at upper primary and secondary level at age-appropriate grade. 70 percent of them joined mainstream schools for their further education. The retention of these students in formal school is above 80 percent. Pehchan project as successful model, still being continued & able to attract funding sources. Replicated by other partner NGOs in 19 districts (eg. Jhalawar , Dholpur , Bikaner, Jaisalmer, Alwar ) with technical support of CULP. During last two years Financial Years (April 2015- March 2016 and April 2016- March 2017, it has been reaching out to in eleven districts and mobilized funds from Government, UNICEF, Save the Children, ActionAid, EdelGive Foundation, Tata Trusts by having formal partnership and individual donors. This campaign created a significant and visible impact about the organization’s work which has been shared with different networks, corporate, funding agencies, government, local social groups, professionals and the innovative practices has been disseminated in both print and electronic media. Recently, a Case Study of CULP titled 'Contextualization of Primary Education in Small Remote Schools of Rajasthan' published in a book titled 'Triggering Success: Innovative Interventions to Promote Educational Access in India released on 22nd December at New Delhi which has created global visibility of the organization with different funding agencies. The fundraising campaign was initiated after CULP getting recognition at National and International fora when it got two prestigious awards, namely (i) Dasra Girl Power Award 2014 for empowering adolescent girls in Education category. The Award is an initiative of Dasra in collaboration with USAID and Kiawah Trust. The award recognizes innovative and high impact work for adolescent girls but also draw attention to issues affecting adolescent girls. (ii) India NGO Award 2014 – 15 in Small category: The Award is an initiative of The Resource Alliance and sponsored by Rockefeller Foundation and EdelGive Foundation. The award recognizes and celebrates excellence in the non-profit sector; promote good standards and practices in resource mobilization, accountability and transparency, over-all credibility of the non-profit sector for long-term sustainability. CULP also got GuideStarIndia Gold Certificate for transparency and accountability for the year 2015. The organization realized to build the capacity of its senior level functionaries (Chairperson, Secretary & Director, Programme Managers) to enhance skills and knowledge on various issues of social development, child rights, gender, documentation, communication, networking and advocacy with different stakeholders at local level to national level and resource mobilization. Seven top level functionaries were trained by participating in national and international workshops, organized by Dasra (2014 and 2015), Harvard University South Asia Institute and Tata Trusts (2016), The Resource Alliance (2014, 2015 and 2016), EdelGive Foundation (2016). They also joined several webinars organized by Harvard University South Asia Institute, Dasra, Girls Not Brides. CULP has also become part of several national and international networks, consortia and alliances (Srijan Network, National RtE Forum, Lawyers’ Collectives, Girls Not Brides) and participated proactively in conventions / seminars / consultations, workshops and contributed significantly on child rights and education (especially girls) to impact on policy issues. CULP is also part of Core Committee constituted by the Social Justice and Empowerment (SJE) Department, Government of Rajasthan for developing strategies and action plan for effective implementation of ST / SC Atrocities Prohibition Act 1995 (amended 2016). This helps the organization to project its work and impact of interventions which leads increased visibility of the organization, resulted the organization’s reach out to the funding sources. The organization’s profile has been showcased on internet and other websites such as GuideStars India, BSE Samman Platform, Dasra, The Resource Alliance, Harvard University South Asia, Girls Not Brides, Centre for Education Innovation. It organized several events with different stakeholders at local level to state level on issues of children, especially empowering girls, such as Education Dialogue (Shiksha Samvad 2013, 2014), Girls’ Festivals / Conclaves (Balika Mahotsavs, Banswara March 2015 and Tonk, October 2015, August 2016). Currently CULP has been directly implementing its programme at grassroot level to impart the quality elementary education to the children of most socially and economically deprived communities inhabiting difficult terrains in rural and tribal habitations of three districts (viz. Banswara, Tonk and Jaipur) in Rajasthan (India). The programme interventions will be up-scaled in 500 habitations in three existing districts and two new districts (viz. Bhilwara and Pratapgarh). For this we require additional one crore rupees per year for bringing social change towards children of most deprived communities, especially focusing on education of out-of-school adolescent girls. In addition to the formal education these girls will be imparted life and vocational skills to make them empowered in the rural society. The girls of economically most vulnerable tribal families will also be sponsored to get higher university level education. Organizing Bridge Course Centres (called ‘Pehchanshalas’) for about 5000 out-of-school adolescent girls (9 to 18 years) for imparting age-appropriate learning level which will help them to join in age-appropriate grades in mainstream schools for completion of further school education. Organizing Life Skills and Vocational Training Camps for rural / tribal girls and strengthening ‘Adolescent Girls’ Forums (Kishori Manchs)’ at village level so that they could feel empowered, establish self-identity and self-esteem in the rural society. Providing academic support to rural teachers for developing their professional skills and creating child-friendly environment in rural schools. 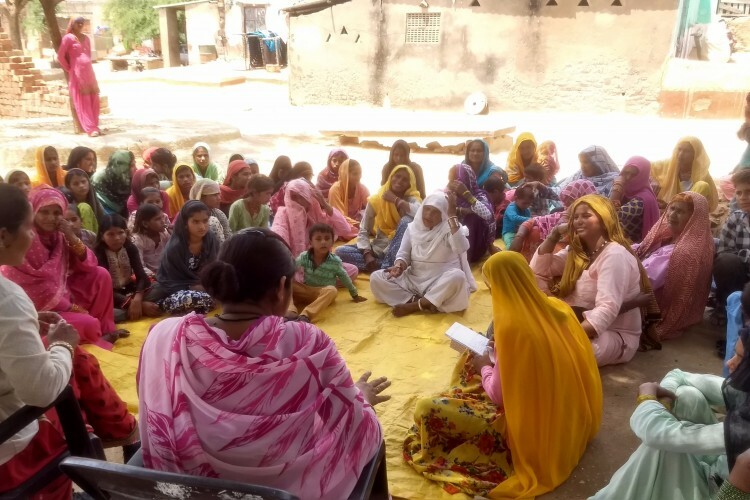 Strengthening community-based institutional structures such as Gram Panchayats, Village level Child Protection Committees, School Management Committees, for ensuring the protection of child rights and quality education to all children (compliance of provisions of Right to Education Act 2009). Handholding support to the government functionaries for their sensitization on children’s issues / rights and improving the functioning in the field. Your share could be as good as a donation for Centre for Unfolding Learning Potentials (CULP)!